TOMBSTONE TUESDAY: Continuing the Geneabloggers meme with a headstone in Barkway, Hertfordshire for Thomas Head and his wife Sarah Cane, formerly Head. Thomas Head and his wife, who remarried. 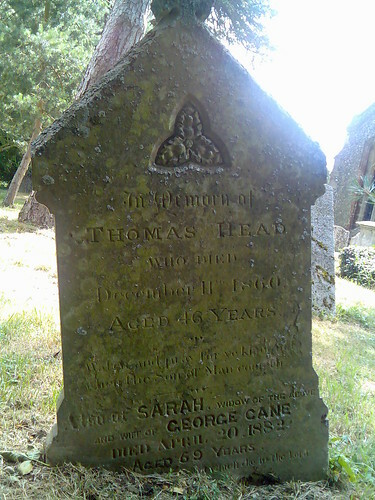 This headstone belonging initially to Thomas Head stood out – he was joined by his wife upon her death, who is noted as his widow but had become the wife of another man. This is the first time i’ve seen a stone recognising a later relationship – which leads me to wonder where George Cane was buried….